Spring is a great time to purge and reorganize your living space while giving everything a good scrubdown. Don’t forget that this is a great time to give your computers the same attention. I like to break my computer spring cleaning into two portions: cleaning the physical machine, and organizing your data. Today, we’re going to focus on cleaning the outside (and inside) of your computer. Be honest: when was the last time you gave your computer a thorough cleaning? If you can’t remember, you’re not alone. In 2008, British technology magazine Which? Computing conducted a survey to see how often people cleaned their computers. Less than half of the people surveyed said they cleaned their keyboards once a month and 10% admitted that they never cleaned their keyboards. Even scarier, they discovered that the average office computer has more germs than a toilet seat! The magazine survey targeted computers in an office but the same can be said of home computers, too. The website Computer Hope has an easy-to-use calculator that shows you how often you should be cleaning your computer. At minimum, you should clean your computer every year or so. Cleaning your computer not only helps keep your computers from becoming germ traps but also helps to maintain your computer. Desktop computers often sit for months, if not years. During that time, they can gather dust, hair and other particulates from the air. If your desktop computer sits on the floor, dust becomes even more of an issue. Dust can eventually coat the internal parts of your desktop, clogging the vents and can contribute to overheating and eventually, hardware damage. Peripherals like printers or scanners can suffer a similar fate. Laptop computers are mobile and generally aren’t as susceptible to dust buildup. What laptop computers excel at is picking up fingerprints and smudges from being handled so often. They also occasionally pick up whatever dirt or other icky stuff they may come in contact with while being used. You will need something to remove dust with. Lint-free cleaning cloths, like a microfiber cloths, work well for cleaning electronics. You can also use a feather duster or disposable Swiffer dusters and you should have a can of compressed air or a electronics-safe vacuum cleaner on hand to help get rid of dust and small particles in your keyboard and computer tower. If you are cleaning a desktop computer, a #2 Philips head screwdriver may also come in handy. Flat panel monitors and/or laptops may require an additional cleaner if dusting is not enough to get it clean. Unplug your computer and anything attached to it, including your mouse, keyboard, monitor and any other cables or peripherals. Take a moment to visually inspect inspect everything. If you notice any signs of wear on your cables, especially fraying or buckling, replace the cables as soon as possible. This is also a good opportunity to clean or change out accessories like your mousepad, wrist rest or any other computer-related desktop accessory that may be prone to wear. Clean off all the visible dust from the surface of your various computer components: desktop tower or laptop shell, keyboard, monitor, mouse, etc. You can use a duster or microfiber cloth or an electronic-safe vacuum cleaner. Keyboards are especially hard to clean with all of their small crevices which hide dust and particulates. Use a can of air or a electronics safe vacuum to get rid of all the particulates before cleaning. If you have a desktop tower, open it to clean the dust from the inside. (This is NOT necessary for laptops.) Desktop towers are especially susceptible to dust buildup since they sometimes sit on the floor or on a desk for years between cleanings. Most desktop towers have handy thumb screws to make removing the cover easy. If yours does not have thumb screws, a #2 Phillips will do the trick. Refer to your computer owner’s manual if you are unsure on how to remove your desktop cover. 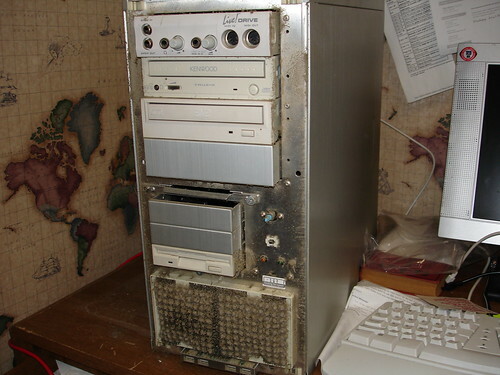 A can of compressed air is the best tool for cleaning out your desktop tower. Spray the fans and any areas with accumulated dust with short, controlled bursts from the can of air. Do this in a well ventilated area to avoid inhaling the dust. While I like vacuums for dusting keyboards, I wouldn’t recommend it for the delicate insides of a desktop tower. The surface of keyboards, desktop computers, laptop shell (not display area), mice and most peripherals can be cleaned with a damp cloth. Take a lint free cloth, wet it with warm water and wring out most of the moisture. Most laptop shells (not display area) can be cleaned in this way as well. LCD monitors and laptop displays should be cleaned with an LCD cleaning agent. LCD cleaners may be available as premoistened wipes or as a spray and cloth kit. If using a spray, moisten the cloth with the spray first and then clean your monitor or display in even strokes and let dry. Do NOT use plain water or any other cleaner. Follow your manufacturer’s recommendations if they specify a brand or type of cleaner for your display. Once everything is dusted and thoroughly cleaned, it is time to put everything back together. Once I’ve resituated everything back on my desk as I like it, I take the opportunity to organize my cables as well. After all, no one likes looking at a cable rat nest, right? I like to use cable ties to help me bundle my cables neatly. I prefer velcro ties to nylon cable ties, mostly because they are infinitely adjustable and reusable. If you want to get really fancy, you can use cable organizers to hide your cables. I like to place a little label near the connector to identify it (ie. mouse, keyboard, camera, PC power cord, monitor power, etc.) My husband thinks it is overkill but trust me, that overkill is TOTALLY worth it when you’re staring at the back of your PC and trying to figure out which cable to pull. Now your computer is shiny, clean and organized! Doesn’t that feel great? Next week = Computer Spring Cleaning, Part 2: organizing and maintaining your data. How often do you clean your computer? What are your favorite computer cleaning tips? Share them with us! Who Says USB Flash Drives Are Boring?